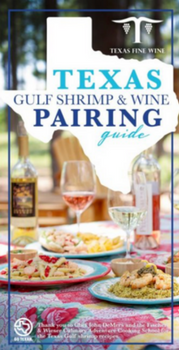 Materials to help you learn about Texas wines and pair popular Texas wines with Texas foods. 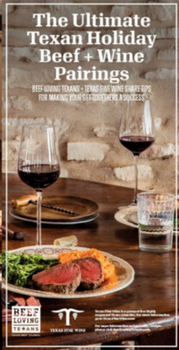 Check out some iconic Texas recipes from the “United Tastes of Texas” cookbook, paired with Texas Fine Wines to showcase the diversity of Texas cuisine and terroir. These delicious beef dishes are meant to be paired with Texas Fine Wines. Go to BeefLovingTexans.com for the full recipes. Fun materials to enjoy at home. 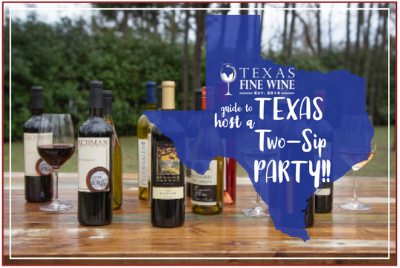 Have a party and see how much your friends know about Texas wine! Blind taste Texas wines against international counterparts using this five page party-in-a-box. Some of the most popular grapes in the world (Chardonnay, Pinot Noir and others) hail from cool climates but Texas grows grapes better suited to a warm climate. Not familiar with Viognier or Tempranillo? 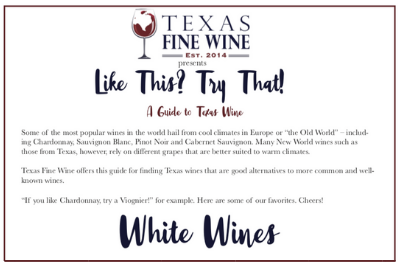 This is your guide to finding great Texas wines that are good alternatives to more familiar wines.